EU Law Analysis: Can Thomas Piketty reform capitalism and democracy in the European Union? Can Thomas Piketty reform capitalism and democracy in the European Union? A few months ago, no one would have predicted that a leftwing French economist would become the intellectual equivalent of a rock star, in particular the UK and the USA. Yet Thomas Piketty has managed this feat with Capital, a tome which suggests a radical new thesis about the link between capitalism and democracy. 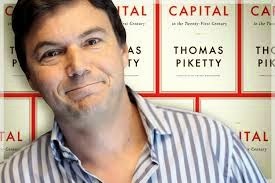 Like other rock stars, Piketty cannot resist the call to lend to his name to good causes. But unlike Bono and Cher, his support for a French academic initiative for EU reform, published recently in The Guardian, is still linked back to his day job. The EU used to be reasonably good at doing capitalism, but not very good at doing democracy; now it is not very good at doing either. So the Piketty thesis suggests a number of major reforms to address both failings. The first of three proposals is that France and Germany, and then other Eurozone countries ‘share’ (he means ‘harmonise’) their corporate income tax. This would entail a common tax base, a minimum rate of 20%, and a ‘federal’ rate of 10% imposed by a Eurozone authority. This would create a Eurozone capacity as regards investment programmes. There should also be automatic exchange of bank information within the Eurozone, an active policy for more progressive taxation of income and wealth and an ‘active fight’ against tax havens outside the Eurozone. Secondly, there should be a parliamentary chamber for the Eurozone, made up of members of national parliaments, selected on the basis of political party representation in national parliaments. The numbers of representatives from each state would be (strictly?) proportionate to the population. It would start with those Eurozone members that support ‘great political, fiscal and budgetary union’, but would be open to all EU countries that share this goal. There would be a Eurozone minister of finance, and eventually a Eurozone government, answerable to this chamber. Piketty and co reject the idea that a second chamber could be made up of heads of state, on the basis that a single individual cannot represent a state. They suggest that the European chamber could address issues such as corporate governance, childcare, training, social legislation and a price for carbon emissions. Thirdly, there would be a debt redemption fund, paying off all debts over 60%, with the Eurozone parliament deciding on ‘the level of the common deficit’ each year. As for how to achieve these aims, they assume that a Treaty change would be necessary. They assert that ‘the Treaties are being modified constantly’, such as in 2012. This is an apparent reference to the Treaty amendment relating to the European Stability Mechanism (ESM), the treaty between Eurozone states which created a sort of bail-out fund. Assuming, for the purposes of argument, that Piketty’s economic analysis is valid, how feasible are the suggested remedies to address the undoubted challenges to capitalism and democracy within the European Union? Starting with the reformers’ final point, Treaty reform is much harder than they suggest. While it is true to say that there have been several Treaty amendments in recent years, they were all minor. The four amendments agreed since the Treaty of Lisbon consist of: the single new paragraph of the Treaty relating to the ESM, which the CJEU said was not necessary anyway (Pringle); a Protocol clarifying the position of Ireland; a Protocol concerning the effects of the Charter of Rights on the Czech Republic (dropped when that country withdrew its request for it); and a Protocol on the numbers of MEPs. The latter three amendments were all leftovers from the Treaty of Lisbon, either being promises made to get it ratified (the Irish and Czech Protocols), or a transitional measure to take account of the delay in in its entry into force. In comparison, a plan to negotiate a more significant Treaty amendment relating to economic governance collapsed in December 2011, when the UK and the other Member States could not agree whether there should be specific safeguards built in for the UK’s financial services industry. The last successful major Treaty amendment, the Treaty of Lisbon, took years to negotiate and ratify (taking into also account the efforts to drawn up and ratify the Constitutional Treaty). Perhaps Piketty and his colleagues were all on sabattical in 2005, when the French public rejected that Treaty in a referendum? Having said that, a Treaty amendment would not be necessary as regards all of the points which they raise. Given the difficulties in agreeing any significant Treaty amendment, and the time it would take to come into force even if the effort is successful, any advocates for EU reform should consider first what reforms can be agreed within the current EU legal order, including enhanced cooperation, and/or in the form of treaties between a limited number of Member States outside the EU legal order. As regards Piketty’s first proposal, a harmonised corporate tax base and a minimum rate could be the subject of EU law, by means of enhanced cooperation (which means using EU law to adopt measures for a minimum group of nine Member States, if not all Member States wish to participate). In fact, there is already a proposal to harmonise the corporate tax base under discussion. Alternatively, a treaty between Member States could address this issue, if it complies with other EU measures on corporate tax, as well as the Treaty requirement of non-discrimination between Member States. However, the EU has limited powers as regards wealth and income taxes. On these issues, though, there could be a treaty among Member States, which would have to be consistent with the EU Treaty rules on non-discrimination. There are many EU measures on the exchange of tax information an EU issue already, and the idea that a group of Member States fight against tax havens within the EU is hugely problematic due to EU free movement rules. Similarly, negotiations with non-EU tax havens can only be carried out by the EU, because to the extent that the issues concerned (like the exchange of information) have been dealt with by internal EU laws already, the EU has exclusive external competence to negotiate such treaties. As for a Eurozone budget, it should be possible to arrange for one within or outside the Treaties, in either case without amending them. On the other hand, Piketty’s third suggestion, the debt redemption fund, really will require Treaty reform, since it is likely to infringe the existing ‘no bail-out rule’ by making some Member States at least partly liable for the debts of other Member States. This brings us to the institutional arrangements. While a Eurozone parliamentary chamber (and the accompanying government and ministers referred to) could be created in a treaty among Member States, any overlap between the powers of these bodies and the existing EU institutions is legally problematic, since the CJEU ruled in Pringle that treaties between Member States were also subject to the rules on the EU’s exclusive external competence. Clearly the proposals of Piketty, et al, would in part create such an overlap, since the Eurozone parliament and government would address issues such as carbon pricing and social legislation. Moreover, any powers concerning a debt redemption fund would entail an underlying Treaty amendment in the first place. It is also unhelpful that the reform proposals ignore the very existence of the Council – the EU body which is made up of ministers from Member States (as distinct from the European Council, made up of heads of state), and which legally speaking does constitute an existing second legislative chamber (alongside the European Parliament) in the EU. Certainly, the substance of any reform initiative could be more easily taken forward by means of reforming existing bodies, rather than creating new ones. It might be fairly quick and simple to agree on the creation of a Eurozone-only element of the European Parliament (if MEPs from non-Eurozone states agree to abstain, or if a treaty between Member States creates such a formation and gives it powers distinct from the normal powers of the European Parliament). The one strong argument for creating a new Eurozone chamber is that such a radical step may be the only way politically to address widespread concern about the legitimacy and democracy of the EU, in particular as a response to the result of the upcoming EP elections. The particular make-up of that parliament being proposed would also address the concerns of the German Federal Constitutional Court about the current make-up of the European Parliament (ie the degressive proportionality that gives smaller Member States more MEPs per person). Again, though, the only safe way to create such a chamber legally is to ensure that its powers are clearly distinct from those of the EU institutions, for instance focussing at first on the harmonisation of taxes which the EU has not addressed, as well as supervision of the functioning of the ESM (which is mainly the subject of an international treaty). One final consequential suggestion (although it would entail a Treaty amendment). The creation of a Eurozone parliamentary chamber would be bound to lead to disputes over exactly where to locate it. The obvious answer is Strasbourg – in return for the European Parliament finally being liberated from holding most of its plenary meetings there, and moving fully to Brussels. Surprisingly, these French reformers do not raise this issue.